Tradition protects technology: The robust Sleeve Angus transports mobile Apple computers and tablets in style. Hamburg, April 2019 - With its new product line, Pack & Smooch once again demonstrates how harmoniously natural materials, traditional craftsmanship and the latest technology complement each other. 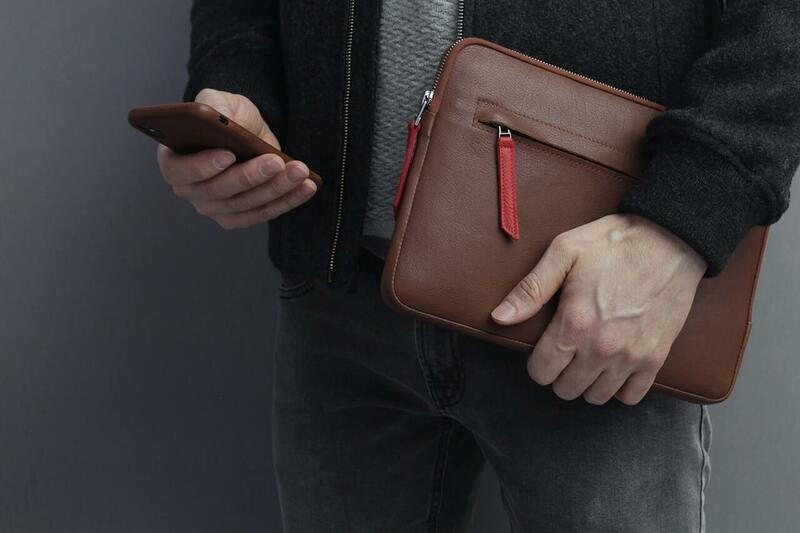 The Angus series leather sleeves are available for MacBook Pro 13 and 15 inch as well as for current iPad models. Each of the minimalistically designed sleeves is a unique specimen made of pure vegetable-tanned, particularly high-quality leather. The tailor-made inner compartment for Tablet or MacBook is softly padded with fine Merino wool felt. For smaller accessories, there is an extra compartment on the outside secured with a zipper. Pack & Smooch obtains the robust leather for Angus from Barcelona. It has the typical fine leather smell and develops a pleasant patina over the years. Small variations and irregularities underline the uniqueness of the natural material. Pack & Smooch processes the leather by hand exclusively in Germany - sustainably and fairly. "Pure vegetable tanned leather is still an exception," explains Matthias Burkert, Managing Director of Pack & Smooch. "More than 85% of the leather available on the market is tanned with chrome, which is extremely harmful to people and the environment. The most environmentally friendly method of leather treatment, natural vegetable tanning, has been used for thousands of years. However, it is much more complex - and therefore also more expensive - than chemical chrome tanning. Every detail is carefully thought out: the softly padded main compartment is designed to make it easy to remove your MacBook or iPad. As an extra, Angus comes with a zippered outer compartment - ideal for smaller accessories. The cases for the iPad are also equipped with a holder for the Apple Pencil. The pocket in card format on the inside is particularly clever. If the business card is placed here, an honest finder knows immediately who to turn to in the event of a loss. Angus is available in two natural colours: Light brown or dark brown. The red zippers on the outside pockets provide an exciting colour contrast. The Macbook sleeves and iPad sleeves of the Angus series are now available in the online shop of Pack & Smooch. Angus is available for iPad 11, iPadPro and iPad Air 10.5 at an RRP of 119 Euro, Angus for iPad Pro 12.9 costs 129 Euro. The case for the MacBook Pro13 is available for an RRP of 129 Euro, for the MacBook Pro 15 inch it costs 139 Euro. All prices include VAT.